Sprains and strains of the lumbar are the results of regular pressure to the area. Lower back strain and or a lower back sprain is the most common reason why patients may be experiencing back pain. 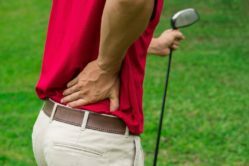 What are the causes of lower back strain and sprain? Lower back strain and sprain of the lumbar is a result of regular pressure to the area. The lumbar is involved every time a person moves, bends or twists. When the muscle fibers are abnormally stretched, it can result in a strain. If the ligaments in the area become torn, it is a sprain. What are the symptoms of lower back strain and sprain? The biggest symptom of lumbar sprains/strains is a lower back pain. This pain often extends to the buttocks. However, it will not impact a patient’s legs. The patient may also experience stiffness in the area, which limits their range of motion. The inability to maintain a solid posture is another warning sign. Muscle spasms are another symptom. Pain that is persisting beyond 10 to 15 days is a major sign that a sprain/strain of the lower back is the culprit. What is the treatment for lower back strain and sprain? You shouldn’t underestimate back issues. When they go untreated, they only get worse. The first step is to go through an X-Ray or MRI to properly assess the area. Treatment may include rest, anti-inflammatory medicines and physical therapy or sports medicine. Those who suffered sports injuries may be in a slightly different boat. The average person who suffers lumbar sprains/strains can get bed rest and manage their activity that stresses the area. Recovery is even more important for an athlete if they want to return to their sport at 100 percent capacity. If you are experiencing any of the symptoms above, it is important that you seek advice from a sports medicine doctor. Dr. Bob Meyer at the Spinal Rehab and Sports Medicine clinic has helped countless patients who reported lower back pain get back to what they love doing most. Dr. Bob will order tests, assess your condition and recommend the best course of sports injury treatment. He is known for his work with athletes, ensuring they fully recover from back issues.